Kerfe at Method Two Madness inspired me recently with this post, in which she drew some of the work of famous artists who attempted to capture the image of the Madonna. I was so taken with her work that I decided it might be fun to attempt something in a similar vein. I’m glad I did, because it may have been the most awe-inspiring day I’ve encountered so far in my art journey. I’ve often described the tingly feelings I sometimes experience when drawing the face of someone I’ve admired. 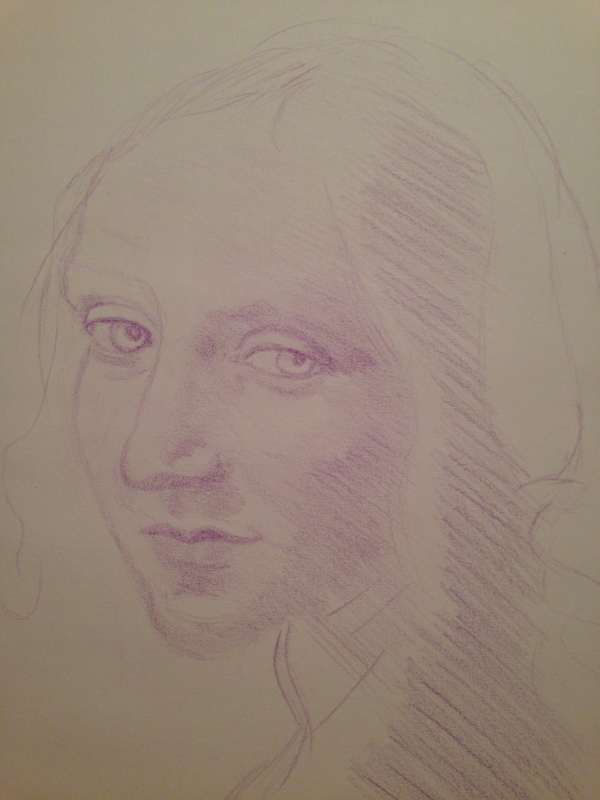 This was an interesting exercise in the sense that I knew nothing about the young woman subject, but in attempting to copy da Vinci’s work, I felt instead a connection to the artist himself, stretching across centuries and an ocean besides, which left me feeling amazed and oddly satisfied, even though I put the sketch down half finished after staying up late with it the first night. It also made me realize that I want to do more of this kind of work. I really enjoy portraits, but drawing the work of one of the Old Masters carries its own built-in awe, regardless of the subject. I found it quite moving, and I would have to be a much better writer to describe the experience more clearly. I hope you’re doing the Saturday dance today, and that you have a truly enjoyable April weekend, whatever that means for you. Peace and arty goodness to one and all! Laura, have you ever thought of going to a museum and drawing some things from there? When we were in London and went to the V&A museum (arty and design) we saw quite a few people sitting and drawing statutes and other things. Yeah, I have! I’ve never been a museum person, but now, I’d look at the experience in a whole new light! Would be neat. And talk about inspirational!! You know I was thinking, especially in regards to another comment here about how well you capture eyes. And it is true – you are really good with eyes. Even beady bird eyes. The person you have drawn… I love her pose, casual and informal, quite informal in a way. I imagine Da Vinci just quickly sketching her as she passed him by. She has travelled through so many mediums. How could she have ever known that over so many centuries people would know her face? She’s on the internet, she’s probably been copied many other times, appeared in books, museums and across the internet. No wonder you found it inspiring. And those eyes look so real, as if they’d only been drawn yesterday – you can see into them and you’ve captured that. Maybe it is just my love for eyes, of course. I love the idea of history reaching across oceans and through time, still being able to affect us today in small ways like this. Isn’t it incredible? Makes the hair stand up on your arms. I was wondering who this woman is, and thinking, too, that he probably sketched her in a few seconds! I’d love to know the story behind it. Her pose is great; it really adds to the allure. As Da Vinci would’ve known, of course. Wow Laura!! First of all the drawing!! Again the eyes! You so master the eyes! So penetrating, deep, soulful. The eyes say it all. No words necessary. But I am also fascinated by your experience drawing it. So cool! Rock on with this girlfriend. I am so touched by this. Thank you, Jodi! It was so moving, I tell you. Drawing a portrait is moving, all by itself, though. But this was just….a whole new level. I’m so glad you enjoyed it! Thank you! And thanks for the inspiration! I feel like there’s lots of room for improvement, but I really liked seeing his actual lines, and trying to kind of walk in his footsteps, so to speak. One late-night portrait I won’t soon forget. You think? I know I wanna do more, at least. I definitely wanna work from sketches, not paintings. Thank you. You’re too kind, but thank you!! Thank you, Jill! I’d like to try this again. The experience was really cool. Portraits almost always do this for me when I’m drawing late at night. Hasn’t happened during the day. I think tiredness and quiet plays a role. She is beautiful and she looks like a Madonna somehow, even if she´s just some girl. What´s interesting to me is that you say you felt a deep satisfaction while drawing this, and that this satisfaction is visible in your artwork itself. This young girl looks completely in peace with herself and deeply satisfied. It´s just wonderful!!! Maybe that´s why she looks like a Madonna to me. Thank you! I was thinking about all of the work you used to do too; paintings of the past…I don’t know much about art history at all, but were you working on the works of the Masters as well? Thank you, I will get hold of it! I appreciate it! You´re welcome! Hope you´ll like it!!! But weren’t you painting the work of previous artists at some point? My memory is so bad, but I feel like I really remember this. Thanks, Teresa! Do you recommend any books about him? Thank you so much!! I really appreciate you saying so!